SEVERAL former LifeFlight patients and their families were given an inside look at the rescue service's new Toowoomba hanger on Friday. 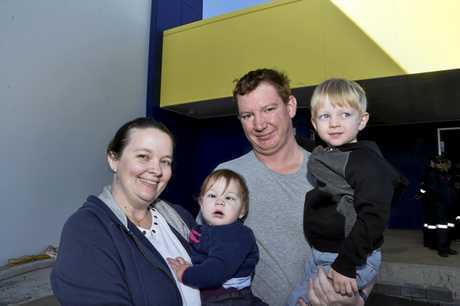 Anthea Brotherton was only six weeks old on November 28 last year when she suffered a stroke and had to be airlifted from Toowoomba to the Lady Cilento Children's Hospital in Brisbane. Parents Karli and Dan Brotherton said LifeFlight got the now nine-month-old into surgery with minutes to spare. Paediatric Intensive Care Unit specialists were on-board with Anthea all the way, but it meant there was no room for Karli on the helicopter. "I just had to put my trust in the doctors and LifeFlight," Karli said. "I knew she was being well-cared for. They kept me informed all the way. Doctors at the hospital told me she got there with only an hour to spare." 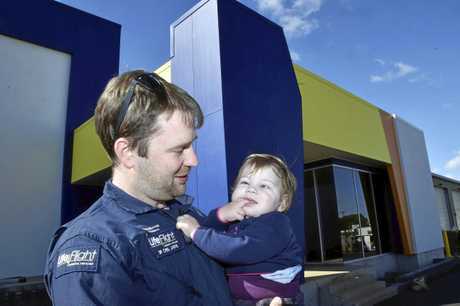 "We don't think we'd have our daughter with us if it wasn't for these guys and what they do. They're life savers," Dan said. "Anthea didn't have time, so they made the world of difference." Anthea spent a week in the paediatric intensive care unit and another two weeks in the hospital. "She's doing really well and hitting all of her milestones," Karli said. "She still has vision loss, she can't see a whole lot in her left eye, but in her right eye she can see about two to three metres." Dan said the whole experience had changed his and Karli's life. "It has been an inspiration to go back and study," he said. "Karli is doing nursing, I'm doing paramedicine," he said. "Everyone involved in her care has made a difference to us." The couple have just begun their second semester of study and said they were really enjoying it and were looking forward to helping other families. "When we got home and everything sunk in, we started looking at some many charities that made our life easier, like LifeFlight, Ronald McDonald House, the Red Cross blood services, The Children's Hospital Foundation, all these little things made a huge difference," he said. "Anything we can do to help these guys out, we'll keep doing it," Dan said. "It's exciting to know (LifeFlight now) have such a good facility to work from now," Karli said. In 2014, Sharon Gitsham heard about an accident on the Kogan Condamine Rd blocking her route home from work, only to discover family members were victims of the crash. Her husband Brad and son Thomas were hit from behind by a driver texting at the wheel of a 35 tonne truck. Thomas was freed fairly quickly and taken to hospital, but Brad was trapped in the wreckage of his ute for three hours. He was in a critical condition when LifeFlight airlifted him to hospital. "Brad was a fencing contractor, he'll never work again but we take each day as it comes. We're so grateful for LifeFlight. We're grateful he's alive," Sharon said. The 52-year-old suffered 16 broken bones and a brain injury. He said he was determined to overcome the effects of his injuries. "Without LifeFlight I'd be dead I'd say," Mr Gitsham said. "I can't remember the accident, I woke up about ten days later in the PA in Brisbane. From all reports and the photos I had seen, I was lucky to get out of there. "It took them three hours to cut me out of the car. I was in a coma for ten days, in the ICU for 17 more days and in hospital all up for four months." Mr Gitsham said he had a strong determination to make it through his injuries. "I have no choice in the matter, I've just got to soldier on, that's all I can do," he said. "To see this (new LifeFlight) facility here, it'll be great when it's up and running." 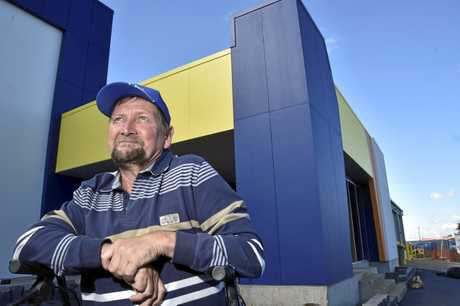 Goomburra man Peter Gilmore, also known as Gilly, suffered bleeding to the brain on August 20, 2017. His wife Helen Gilmore said the truck driver would be dead if it wasn't for the service. 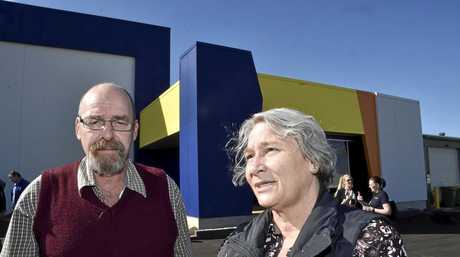 "Gilly was working in the shed when he collapsed," Helen said. "We ended up getting an ambulance and he was rushed to Warwick. They did some CT scans and found out he had a haemorrhage in three parts of his brain and halfway down his back. "Two hours later he would have been in a semi-trailer going down to Sydney, it was a small mercy he wasn't. "It took 40 minutes to get to the Gold Coast with LifeFlight. In an ambulance he wouldn't have made it." Helen said her and Gilly would be forever grateful to LifeFlight. "I tell people, don't just pray for the person in the helicopter when you see one, pray for the crew, because if it wasn't for the crew a lot of people wouldn't be here today," she said. 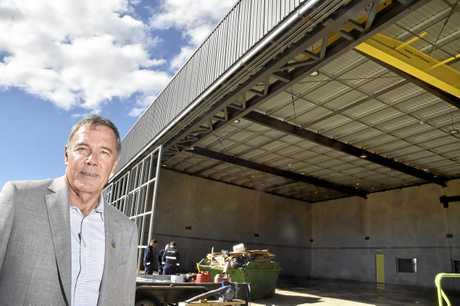 The new hangar at the Toowoomba Airport will be known as the Clive Berghofer LifeFlight Centre. LifeFlight director Stewart Morland said the new facility was a massive upgrade on the old tin sheds that LifeFlight used to operate out of and the new facility would have features such as crew accommodation, office space, engineering facilities and more. It is set to become operational next month and will open to the public for the LifeFlight Ball on September 1. Tickets for the major fundraising event are available at https://bit.ly/2AwbMxz.